The story is troubling because (a) probing potentially criminal money laundering is the job of the Justice Department which can impose criminal charges, not the job of the Fed which cannot; and (b) the Fed is notorious for slapping knuckles and imposing small fines. The Fed’s New York regional bank, which plays an outsized role in the Federal Reserve system, is a deeply conflicted regulator. And, let’s not forget that it was the Fed that secretly funneled $16.1 trillion of almost zero interest loans to the global banks from 2007 through the middle of 2010 and then fought in court for years to try to keep these loans a secret from the American people. Danske Bank is already under a criminal investigation by the U.S. Justice Department over the potential laundering of upwards of $230 billion out of Russia from its tiny Estonian branch. A November news report at Bloomberg indicated that Deutsche Bank, JPMorgan Chase and Bank of America had also been drawn into the Justice Department’s probe. An earlier report in September of last year by the Wall Street Journal identified Citigroup as involved in transactions going in and out of the Danske Estonian branch, according to a whistleblower complaint filed with the SEC over two years ago. The public needs no further proof of the Fed’s inability to supervise the global banks than the fact that, at a time when it had dozens of its own inspectors sitting inside the banks, the banks were able to create toxic waste dumps of subprime debt and derivatives that blew up the U.S. financial system, the housing market, and the U.S. economy in 2008 while also taking down 100-year old Wall Street institutions. If that’s not incompetence, we don’t know what is. Then there was all that schmoozing that then New York Fed President Tim Geithner was doing with Citigroup as the bank spun toward insolvency. The schmoozing paid off well for Geithner — he became U.S. Treasury Secretary — and very badly for U.S. taxpayers; they had a gun put to their head to give Citigroup the largest bailout in U.S. history. Money laundering is something that global banks operating in the U.S. have been allowed to get away with for decades. Senate hearings in 1999 revealed the systemic role that Citibank had played in money laundering. The investigations of the business bank account that Ponzi schemer Bernie Madoff had maintained at JPMorgan Chase revealed that when the bank saw potential money laundering in the account, it reported it to U.K. regulators but not to the U.S. as it is required to do under the law. The news out this morning could not come at a worse time for Deutsche Bank or the big Wall Street banks like JPMorgan Chase, Citigroup, Goldman Sachs, Morgan Stanley and Bank of America. 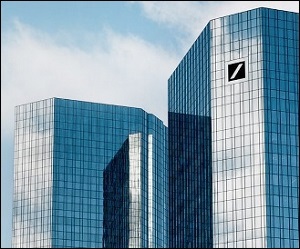 Deutsche Bank lost a whopping 58 percent of its equity market value last year and, according to a 2016 report from the International Monetary Fund, it is heavily interconnected financially to those five big Wall Street banks. Derivatives likely play a role in those interconnections. “We write seeking information relating to two internal reviews reportedly conducted by Deutsche Bank (‘Bank’): one regarding its 2011 Russian mirror trading scandal and the other regarding its review of the personal accounts of President Donald Trump and his family members held at the Bank. What is troubling is that the Bank to our knowledge has thus far refused to disclose or publicly comment on the results of either of its internal reviews. As a result, there is no transparency regarding who participated in, or benefited from, the Russian mirror trading scheme that allowed $10 billion to flow out of Russia. Likewise, Congress remains in the dark on whether loans Deutsche Bank made to President Trump were guaranteed by the Russian Government or were in any way connected to Russia. It is critical that you provide this Committee with the information necessary to assess the scope, findings and conclusions of your internal reviews.